One area that sets Poineau Woodworker apart from other design/build firms is the Architectural Mill shop. Having an in house cabinet shop allows Poineau Woodworker to easily integrate all aspects and details of the interior trim package into one theme. 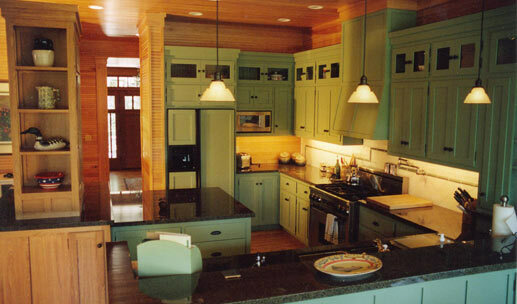 By building interior doors, cabinets, and millwork in-house we have ultimate control over materials and finishes. Kurt Roland has worked for Poineau Woodworker since the construction of our first home in 1983. In 1997 Kurt became the woodshop manager and started an education in Design. Kurt currently designs cabinets, doors and architectural details for our projects as well as heading up the mill shop. In addition to Poineau Woodworker projects we produce cabinets, interior doors, and furniture for sale direct to homeowners and outside contractors.